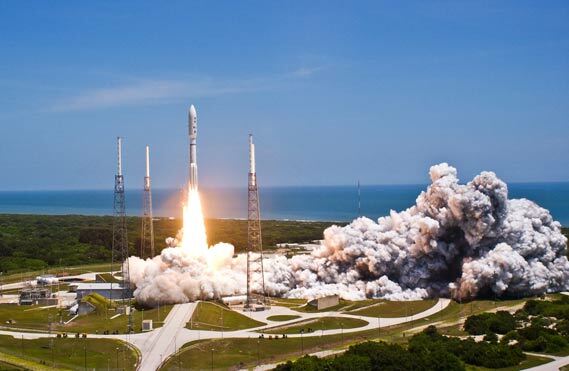 A United Launch Alliance Atlas V rocket blasts off carrying NASA's Juno mission. 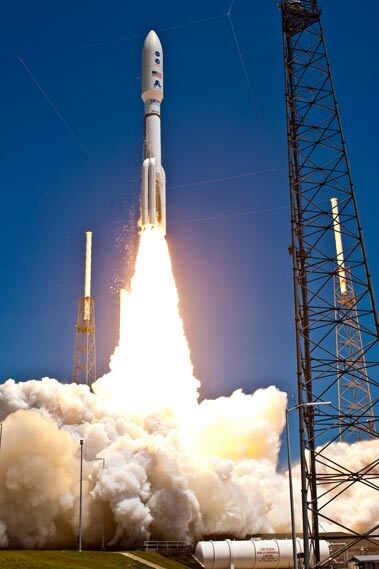 Photo: United Launch Alliance. 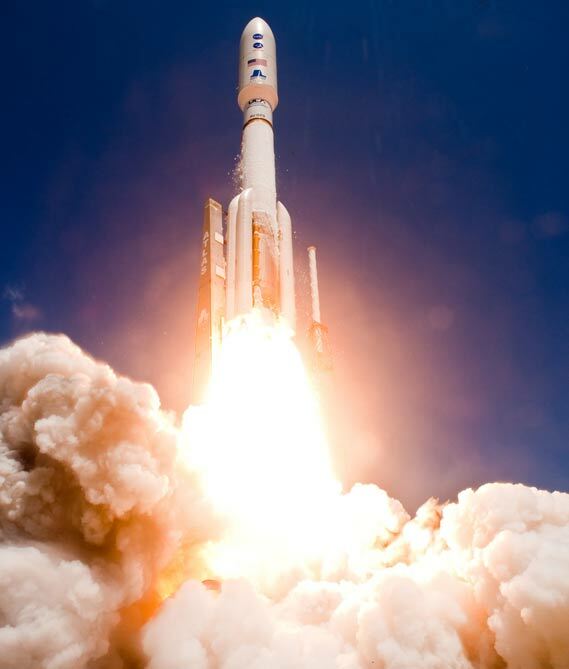 The launch marks the second of five launches for NASA in 2011. Photo: United Launch Alliance. NASA's Juno planetary probe, enclosed in its payload fairing, begins its five-year journey to Jupiter atop a United Launch Alliance Atlas V-551 launch vehicle from Space Launch Complex 41 on Cape Canaveral Air Force Station in Florida. Photo: United Launch Alliance. 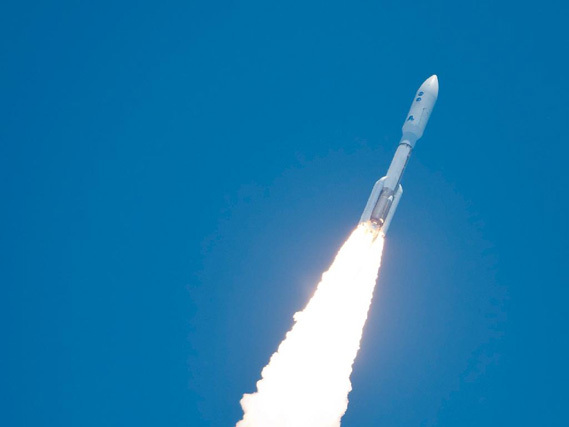 The Juno spacecraft, safely enclosed in the payload fairing at the top of an Atlas V rocket, begins its journey to Jupiter with a spectacular midday launch. Photo: NASA/Bill Ingalls. 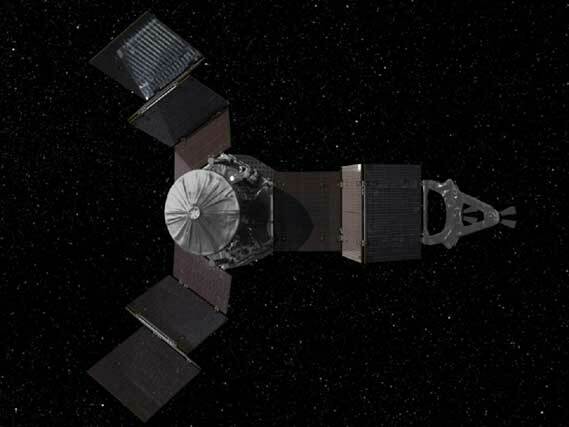 This still image from a Juno mission animation shows how the spinning spacecraft might look during deployment of its giant solar arrays. Photo: NASA/JPL-Caltech. 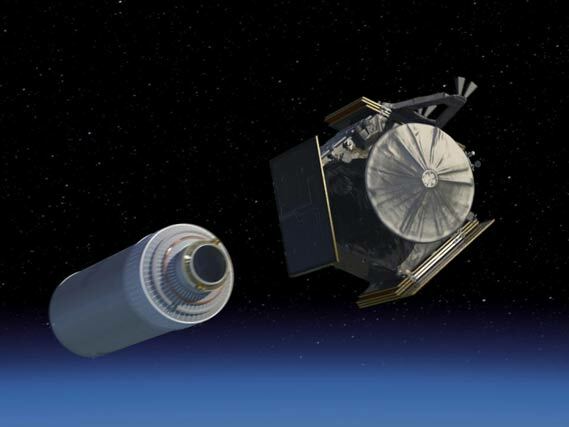 This still image from a Juno mission animation shows the spacecraft soon after launch as it separates from its Centaur upper rocket stage. 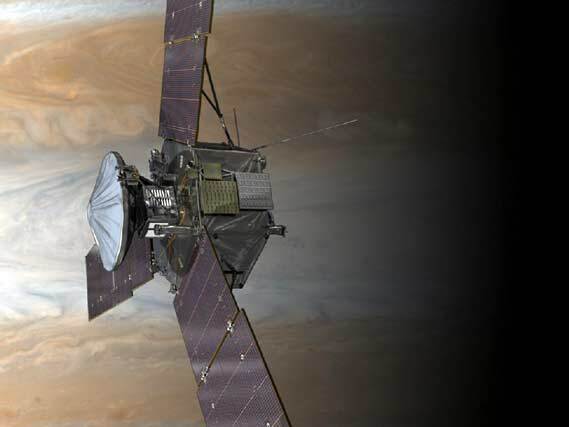 The Juno spacecraft is in its stowed-for-launch configuration here, with its three large solar arrays folded against its sides. Photo: NASA/JPL-Caltech. 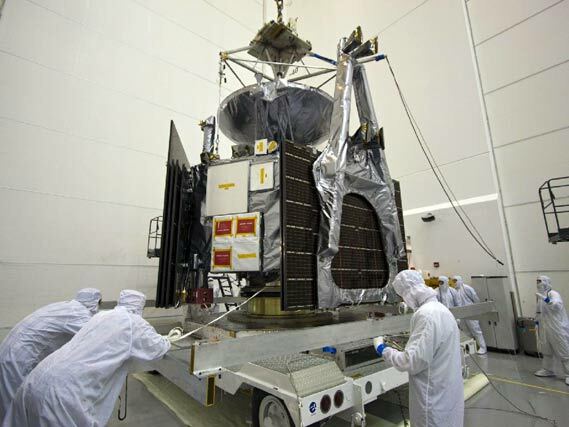 At Astrotech's Hazardous Processing Facility in Titusville, Florida, technicians disconnect NASA's Juno spacecraft from its transport prior to its move to a fueling stand where the spacecraft will be loaded with the propellant necessary for orbit maneuvers and the attitude control system. Photo: NASA/ Troy Cryder. 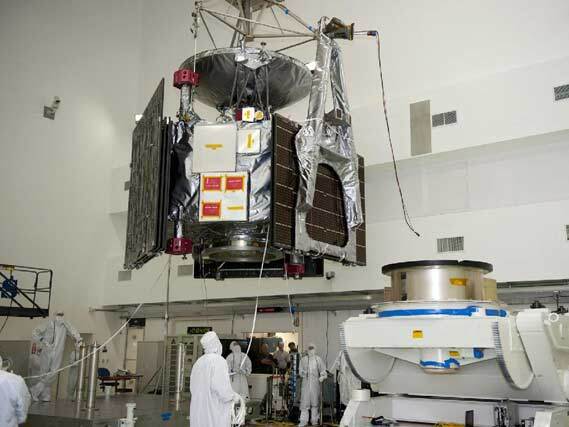 Technicians at Astrotech's payload processing facility in Titusville, Florida monitor NASA's Juno spacecraft as it is moved by an overhead crane to a rotation stand for center of gravity, weight and balance testing. Photo: NASA/Kim Shiflett. NASA's Juno spacecraft is shown in orbit above Jupiter's colorful clouds in this artist's rendering. Photo: NASA/JPL-Caltech. 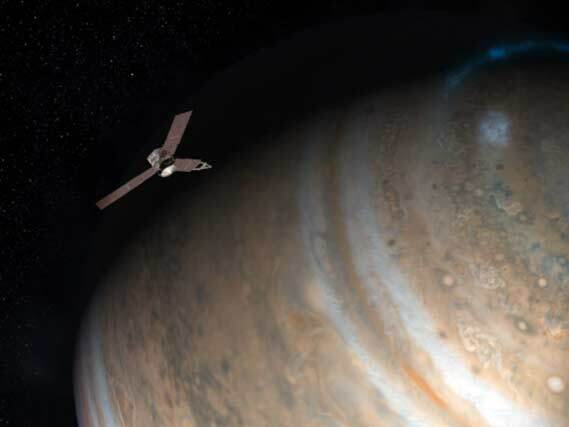 This still image from a Juno mission animation shows the spinning, solar powered spacecraft in orbit above Jupiter's north pole. The bluish glow of the planet's auroras is seen far below. Photo: NASA/JPL-Caltech. 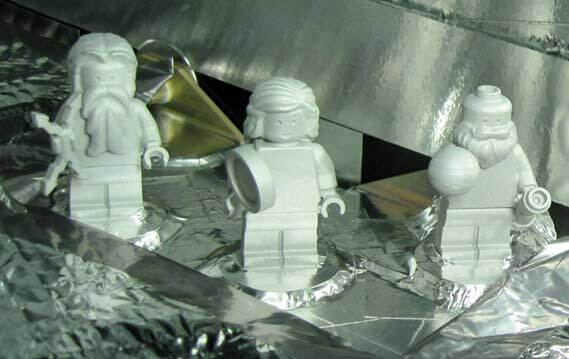 Three LEGO figurines representing the Roman god Jupiter, his wife Juno and Galileo Galilei are shown here aboard the Juno spacecraft. Photo: NASA/JPL-Caltech/KSC. 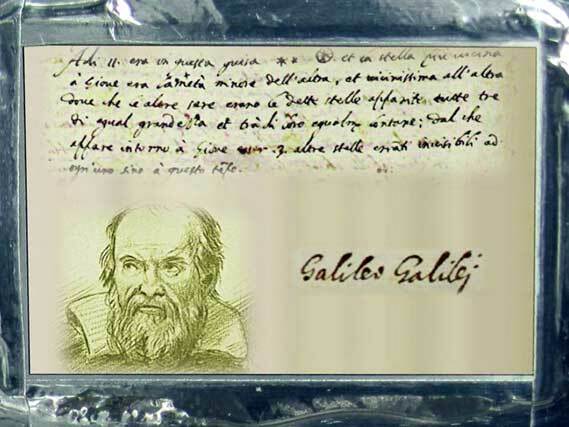 A plaque dedicated to the famous astronomer Galileo Galilei can be seen here on NASA's Juno spacecraft. Photo: NASA/JPL-Caltech/KSC.